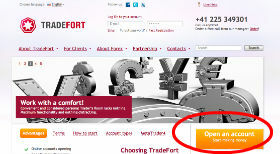 Tradefort offers a $5 no deposit bonus as a forex welcome bonus to all new traders. Altough it doesn't currently also offer a deposit bonus, it does have something very interesting to offer to serious traders, namely a free VPS server for Expert Advisors (forex bots). Please make sure you verify your account, as it is needed to receive the $5 no deposit bonus (more info under 'Bonus Details'). Tradefort uses MetaTrader for as its trading platform and the spreads are competitive. Smalles accounts are micro accounts (1 pip = 10 dollar cent). You need to verify your identity in your Trader's room (see images on the right of this page for help). As soons as your account is verified, the 'Get Welcome Bonus' button under the 'Bonus' tab will become active. The 'Welcome Bonus' button is only active for the first 10 days starting from the date of account registration. To withdraw the bonus, you need to trade 1.5 Standard Lot for each dollar in bonus. If you deposit your own funds, you can withdraw those funds and profits you made with those deposited funds without any restrictions. You can get a free VPS Server to let your mechanical trading systems (MTS), a.k.a trading bots, expert advisors, run on your MetaTrader 4 account without you having to keep your own computer running and / or having access to a stable, high-quality and high-speed internet connection. With a VPS you could trade simultaneously from a local coputer and a remote terminal. The server can be accessed 24 hours from any point in the world, by using any computer or modern cell phone. All you need is internet access and an access password. For serious, high volume traders this can be quite an advantage, even if Tradefort doesn't offer a deposit bonus. TradeFort uses only Metatrader as its trading platform. It has no webtrader, meaning it is not very suitable for apple and linux users. It also offers no mobile trading for smartphones of its own. 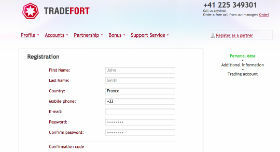 Tradefort offers a wide spectrum of forex currency pairs. 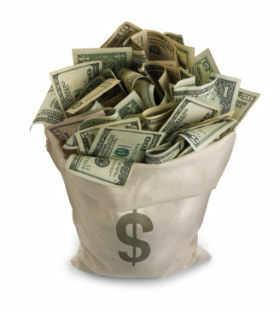 Aside from that you can also trade in American stocks at Tradefort, as well as in oil and metals like gold and silver. The $5 no deposit forex welcome bonus is a nice way to get to know TradeFort, especially since they offer micro accounts where 1 pip is only 10 cents. For serious traders the VPS server can be quite interesting, as it offers the possibility of a very stable trading environment when you want to use Expert Advisors (forex bots). 5. $5 added to your account!